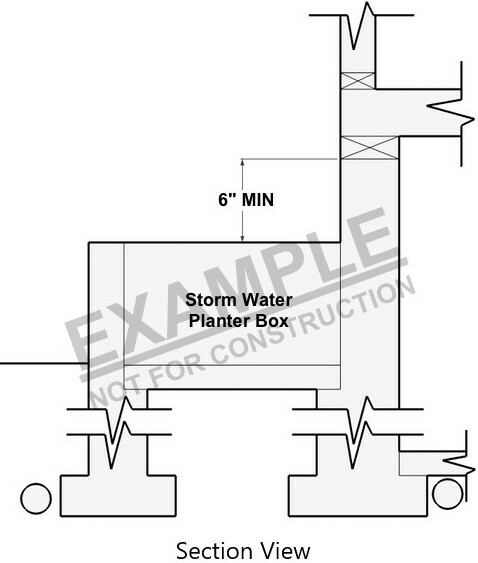 Stormwater retention planter boxes are oftentimes located on the building site as part of a system to meet the Department of Environmental Services’ (DES) requirements to mitigate storm water runoff. The building code does not require them. However, when required by DES, the Virginia Residential Code must be met so that their presence does not harm the house. The information below is to provide general guidance for the information required on plans to comply with requirements of Virginia Residential Code. See the Department of Environmental Service’s guidance on how to comply with the Stormwater Management Ordinance (County Code Chapter 60) as well as §3.2.6.A.3(a)(3) and §3.2.6.A.3(b) of the Zoning Ordinance. Subsection A.1. Please contact the Zoning Division and the Department of Environmental Services (DES) for additional requirements based on their regulations. 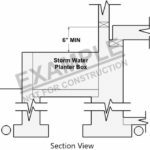 Structural or architectural plans must include a section of the planter box showing the means of structural support for the planter box and demonstrating that the planter box does not adversely impact the foundation of the house. This structural support can follow a prescriptive method from the code, such as footings to undisturbed earth, or an engineered solution. 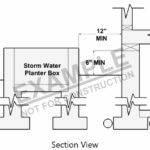 If the planter box is located against the house, the house and box must be designed for protection of the house framing against wood decay. 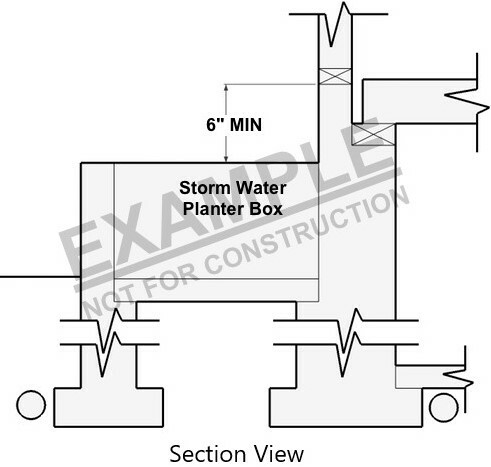 All wood elements, such as the floor system, located 6” above the top of the planter box or the top of the overflow drain for the planter box, based on section R404.1.6 of the Virginia Residential Code 2015. Continuation of the concrete foundation wall to 6” above the top of the planter box, based on section R404.1.6 of the Virginia Residential Code 2015. 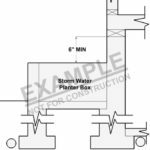 This may result in an engineered design for the wall bracing if the concrete foundation wall stepped since this does not follow the prescriptive methods of the Virginia Residential Code 2015. 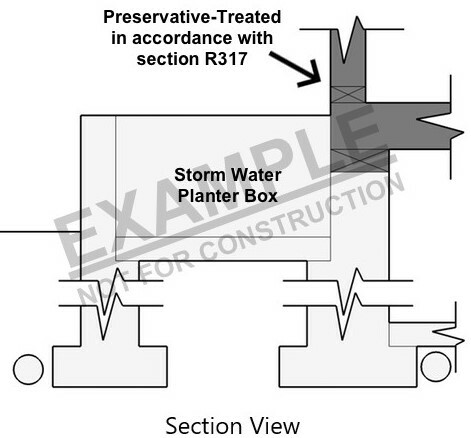 The box can be located away from the house wall framing, with a minimum of 12” clear horizontal distance between the closest face of the box and the house based on section R317.1 of the Virginia Residential Code 2015. Please check Zoning setback requirements if you decide to use this method. 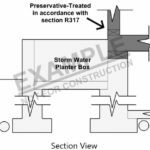 All wood elements along the planter box must be pressure-preservative-treated wood based on section R317 of the Virginia Residential Code 2015. 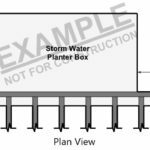 Civil, architectural and structural plans must be coordinated and provide adequate detail to determine that the planter box design meets the requirements of all Arlington County departments. 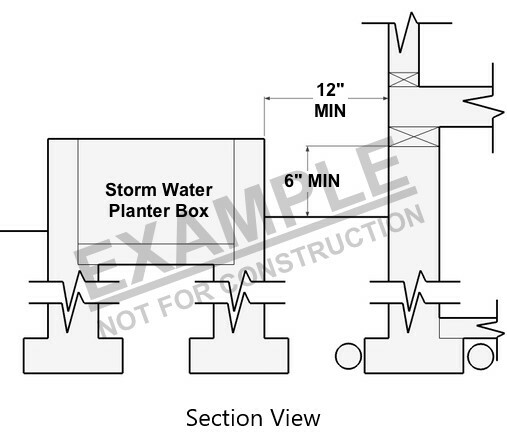 The elevation heights of the planter box and the first floor must be consistent on all sheets.